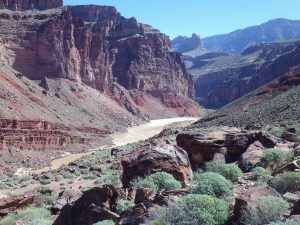 The hike from Hance Creek down to the river, and Hance Rapid (the mouth of Red Canyon) is about 6.5 miles. Heading-out Hance Creek is pretty easy, not too steep or loose. 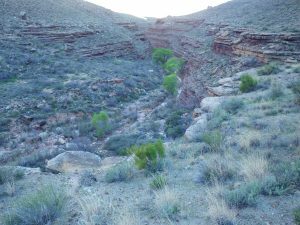 I left my campsite at Hance Creek around 7:30, and had good hiking weather – not hot, nice breeze, etc. Even in mid-March, as you drop lower into the canyon it can feel hot. The reflected heat always feels about 15-20 degrees warmer than the ambient temperature. 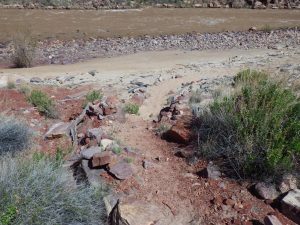 The hike down to Hance Rapid is also dry. 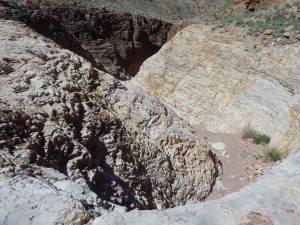 Along the way, you hike through Mineral Canyon, a very interesting section of the Tonto. You pass through layers of petrified water ripples – shallow lake or sea shore deposits. These sit directly atop a huge, cemented cobble bed, resembling a frozen river bottom. It’s pretty cool. As I was heading out this canyon, I passed two small, separate groups that were hiking out the Grandview. They’d come down the Tanner a few days before and were enjoying their last couple of days on the trail. After you leave Mineral Canyon behind, you arrive at the top of a sloping rock garden. The trail winds it’s way through the large boulders, often marked by cairns. There are a lot of good places to duck into the shade here if you’re overheating. You can see Hance Rapid, and you can hear it! 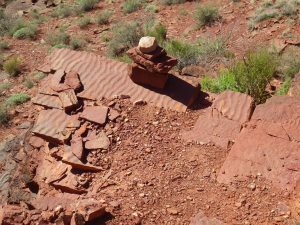 About 45 minutes or so, the trail unceremoniously dumps you out at the edge of the beach, and when you pass between the two cairns, you’ve come to the end of the Tonto Trail. You’re now on the Escalante Route, that will carry you east to the Tanner Trail. The trail goes along the beach for a short distance, past a couple of larger boaters campsites and then ascends up slightly, into the sand dunes. This little bit doesn’t make for pleasant hiking, with a pack on, but the dunes are quite scenic and, when I went through, covered with Sand Verbena flowers. 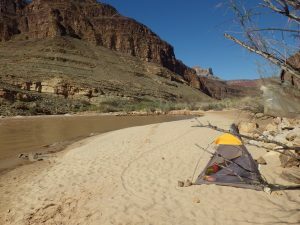 My destination for this afternoon was a campsite, by the river, at the top of Hance Rapid. There is a very nice site situated under a small grove of large mesquite trees, and I usually stay there. It is really set up for multiple tents/people, so I opted for a small, single site in the willows below. The big site is for sharing with friends and, again, I didn’t want to take up more room than I needed, in case a larger group showed up. As it was, I didn’t see another human soul all day or that evening. I had the entire area to myself! 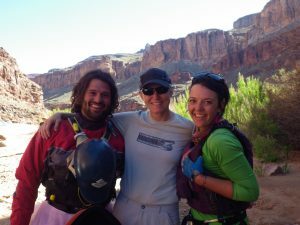 I took advantage of the shallow, sandy bottomed river by my campsite and cleaned up, rinsed clothes and just relaxed and enjoyed the roar – Hance Rapid is a loud one. 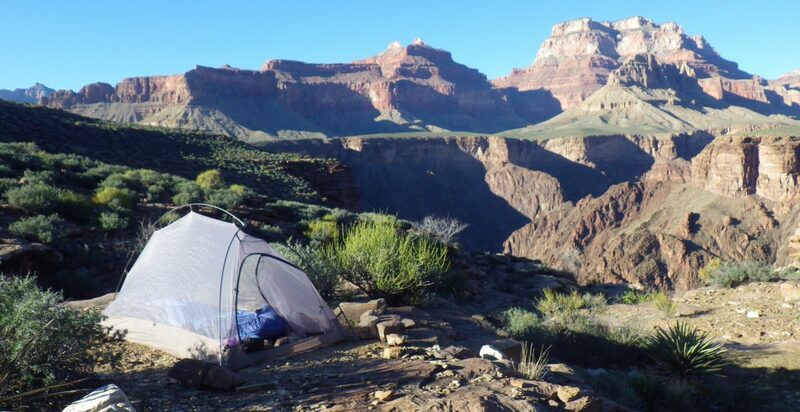 After a light dinner of Mountain House Lasagna (one of my favorites) and some chocolate, I crawled into my tent and fell asleep to the roar and vibration of the rapid. I wanted to get an early start tomorrow, and would be looking out for my friends that had put in on a raft trip, seven days prior. I knew they’d be floating through this section (15 – 20 miles) and hoped to at least catch a glimpse of them. I know, total long shot… I also had the infamous “Papago Slide” to deal with in the morning, and wanted to put it behind me before it started to warm up. Papago was waiting for me. I woke up early, even though I knew I only had around four miles to hike, today. 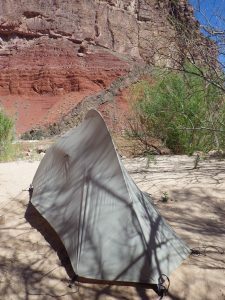 My plan was to hike up to the mouth of Escalante Creek, and if the beach was dry and available, camp there. 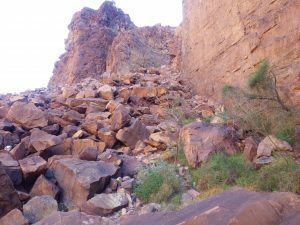 First, I had to maneuver up the Papago – a 20-minute crawl up a large, cone-shaped talus slope. The trail ascends this thing because the river cuts it off at the cliff edge below. It’s about a 45 degree slope, completely covered with assorted rubble/boulders/rocks in various stages of “stability” or, instability depending on where you put your feet. The trick is to keep an eye out for the “trail” (the obvious route previous hikers have taken), check the slabs you’re going to step on and make sure they’re solid, and move quickly. If you’re going up, I find the right side to be preferable. About half-way up, small stones began tumbling down past me, and I looked up to see a family of “Bumblies” trying to descend, in mass, down the upper left side. I asked them to please wait until I was up and clear of them, and they seemed quite surprised to see me. I’m not actually sure how they got to where they were, but when I suggested going down one at a time, and following the cairns, they agreed that it sounded like a good idea. At the top, I stopped to take a photo and yelled “Hi!” to a kayaker floating past, below. He told me there was a large group of boaters camped about 1/4 mile up-river, and I might find my friends there. I’d been really lucky on my trip, so far. Maybe it would be Kat and Joe! 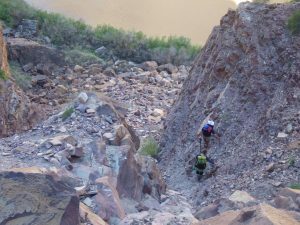 After you get through the “Slide” you have to down-climb the Papago Ledges. It’s a short, easy, class V section of slabby ledges. A section of rope or cord comes in handy here for lowering packs. Being solo, I chose to use caution and lowered my pack down all three short, down-climbs. Reshouldering the beast, I hit the edge of the beach and walked over to the rafter’s camp. They were just finishing rigging their rafts for the day when I caught sight of my friend Joe – I’d know those striped boardie shorts anywhere. I casually strolled up to him (he didn’t know I was in the canyon) and smiled. He looked a bit shocked, let out a few endearing expletives and gave me, and my pack, a giant bear-hug. “What the #$&* are you doing down here?! ?” After recovering, he told me where Kat was, and I went over and startled her. She knew I would be in the canyon but, like I had also assumed, didn’t think we would actually intersect on our trips. It was really fun running into them. Just like I was, they were having a fantastic trip! After catching up for a few minutes, it was time for them to get going, and I needed to start my hike up as well. Kat gave me a much battered can of beer, that I would “put in the fridge” once I made camp. I waved them all on their way, and started out, on my way. 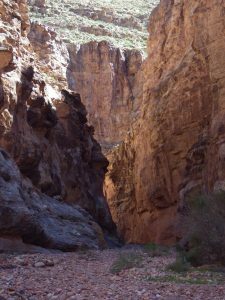 A quick hike around from the top of the slot canyon, and you descend down to the river along a route of mixed dirt path and stone ledges. Here, I found the beach I was hoping would be dry and empty, dry and empty. It was all mine. 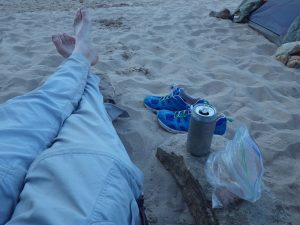 I set up my camp at one end of it, put my beer in “the fridge” and enjoyed a long afternoon at the beach: wading, drawing, filtering water, snacking and relaxing. There was a breeze blowing that evening, so after dinner (Chili-Mac washed down with a cold beer) and cleaning up, I put the fly on the tent. It helps keep sand dunes from forming inside. Tomorrow would be a long, hot, mostly dry day with a lot of narrow, up-hill trail to cover. Happy Hour, thanks to Kat.